A Jeep Cherokee sits atop a makeshift ramp on a border fence in a remote area of the Sonoran Desert after getting stuck and being abandoned during a pursuit which kept the drugs from getting into the U.S., Border Patrol said. U.S. Border Patrol agents assigned to Ajo and Welton stations collaborated with Mexican authorities to seize a drug smuggling vehicle in a remote area of the Sonoran Desert Wednesday evening. 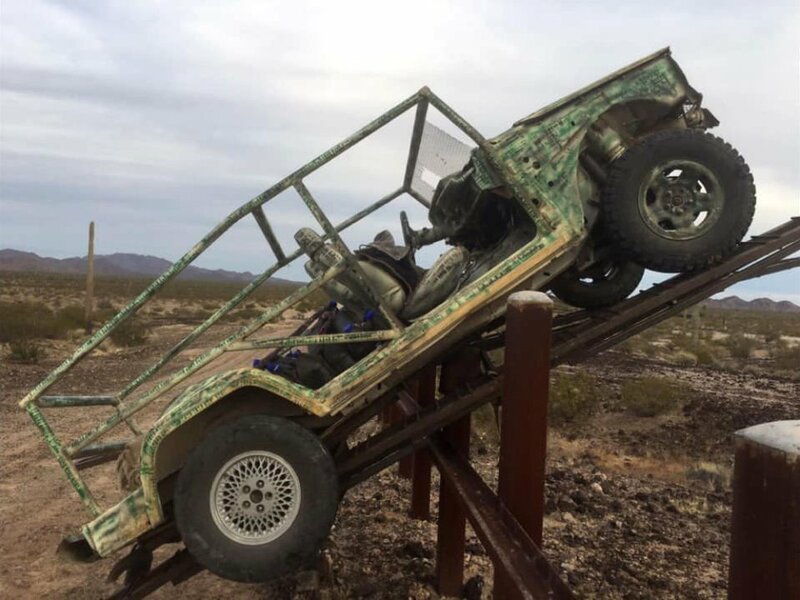 After a failed attempt to drive across a makeshift ramp, the Jeep became stuck on the post and rail vehicle barrier, and the occupants fled into Mexico with the suspected marijuana. Close to a dozen people carrying bundles of marijuana fled back to Mexico on foot when their Jeep Cherokee got stuck atop the border fence in a remote area of the Sonoran Desert. Mexican officials sent military personnel to the area Wednesday to search for the group, but neither the 11 people who had been inside the Jeep, nor the marijuana, was found, the U.S. Border Patrol said in a news release. U.S. agents patrolling a stretch of desert spotted tracks from an off-road vehicle on protected land in Cabeza Prieta National Wildlife Refuge about 4 miles north of the international border, the news release said. The agents couldn’t see the vehicle, but asked an Air and Marine Operation helicopter crew for help. That crew was able to spot the camouflaged Jeep Cherokee heading back south to the border to escape. The Jeep had been modified and painted to blend into the desert landscape. The Jeep got stuck when its driver tried to take it across a makeshift ramp placed atop the border barrier, a fence made of posts and rail usually about waist high. “The agents were on their tail and the helicopter was able to see them, but ground agents weren’t able to make an apprehension because they were ahead of them,” Border Patrol agent Daniel Hernandez said. The pursuit did result in keeping the drugs from getting into the United States, he added. 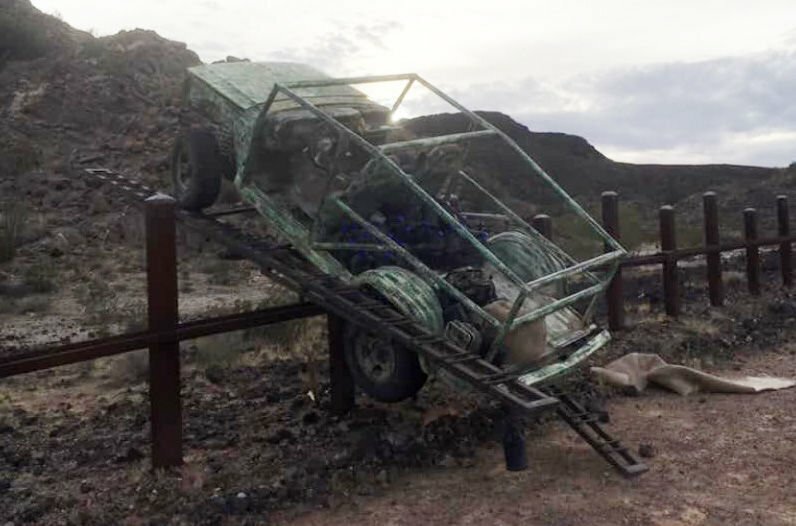 Border Patrol agents found the location where the Jeep initially entered the U.S. and recovered two additional homemade vehicle ramps. While it is not extremely common, this is one of the methods used to smuggle drugs. Border Patrol agents have a name for it: the ramping method. In 2012, a photo made national news of a silver Jeep Cherokee stuck atop a 14-foot fence as it tried to cross a downside portion of a ramp in the Yuma Border Patrol sector. Company says it's realiging its workforce, still hiring for key positions.